Chestertown MD (October 18, 2017) — Maryland PACE, a statewide partnership anchored by The Maryland Clean Energy Center to promote the finance of energy saving projects for commercial properties, announced today that the first C-PACE (Commercial Property Assessed Clean Energy) financed project in Kent County has been approved. State-wide, the approval marks the third in the nascent program’s history and the first for a ‘main street’ retail business. 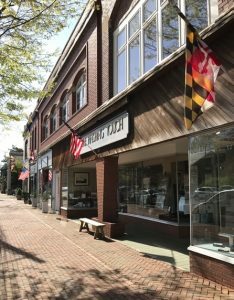 The Finishing Touch, a custom frame and print boutique in downtown Chestertown, owned by Robert Ramsey, will utilize the commercial PACE (C-PACE) program to finance $134,438 in energy savings improvements including new windows and a full HVAC system upgrade. The Finishing Touch represents a model for “Main St.” businesses to save on operating expenses with C-PACE. The program is not a grant as private capital is provided, in this instance by Greenworks Lending, a specialty C-PACE lender. Rather than a traditional working capital loan or cash-out from a commercial mortgage refinance, Ramsey will repay his investment in reduced operating expenses via a special tax assessment with a term of 20 years. The project at 309 and 311 High St. in Chestertown will replace air conditioners and windows that date back to 1978. Pinder and Blue Heron Contracting, top providers of energy efficiency projects on the Eastern Shore, will develop and install the upgrades. The HVAC upgrades are projected to save $6,420/year in energy expenses while more than 1,000 sq.ft. of low R-value glass will be replaced, improving the building’s overall energy efficiency year-round. MD C-PACE is an innovative and affordable way for commercial, industrial and nonprofit building owners to pay for green energy upgrades. The program provides 100% up front financing that is repaid over long terms (often 20+ years) via a property-tax surcharge. The structure allows owners to replace end-of-life equipment with no upfront capital outlay and to see immediate net operating income (NOI) improvement when upgrading a wide variety of equipment including HVAC, lighting, roof, envelope, solar, and cogeneration. Maryland passed policy enabling C-PACE in May 2014 and Kent County passed an ordinance establishing its program in September 2016. Kent County became one of the first counties on the Eastern Shore to enable C-PACE financing for its business community. To see a list of current jurisdictions that have enabled PACE in Maryland, please click here. MD-PACE is a statewide partnership between PACE Financial Servicing and the Maryland Clean Energy Center to build a statewide commercial Property Assessed Clean Energy (C-PACE) program.